I love spending time with my family especially summertime. It is the best time for us as a family to spend time together. No day-to-day destructions from work and school, it is just us. Summer vacations are the best time for us to relax and enjoy every minute with family, it’s as precious. 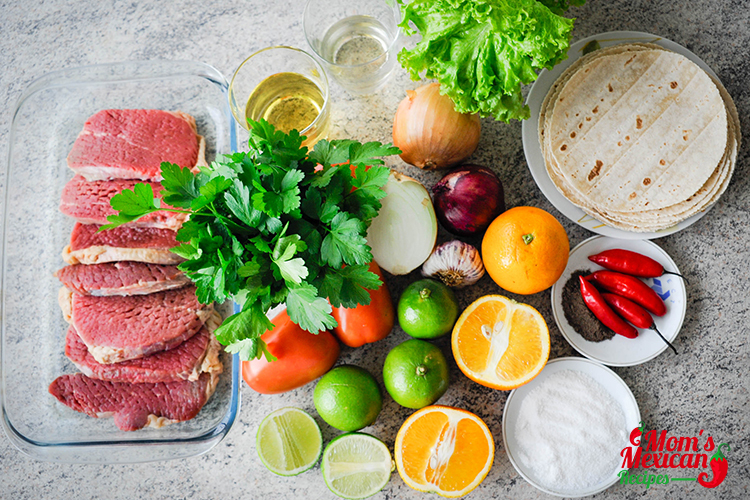 So today, let us talk about another Authentic Mexican Dish, the Tacos Carne Asada Recipe. We love to cook and to eat Home Cooked meals. We also enjoy eating outdoors, having a barbeque picnic in our backyard and inviting friends. Chatting, catching up on our lives and watching my kids, talking, singing and laughing, it is my cherished moments. And for tonight, we’re having a picnic party with some of our close friends. I’m going to prepare a delicious and easy to make recipe that everyone will love. 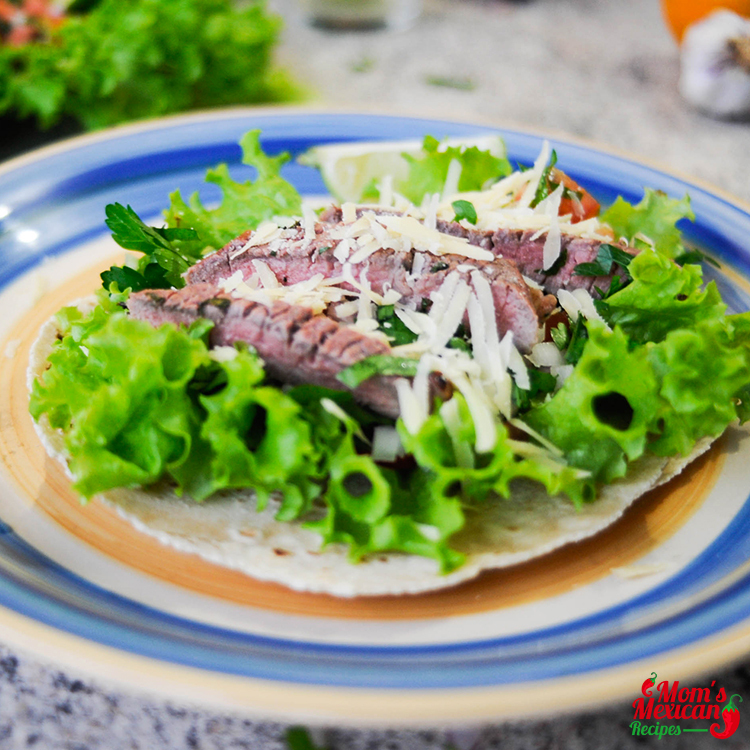 It is a Tacos Carne Asada Recipe, a simple tortilla wrapped around a filling. Tacos can be eaten as a snack or can be the main course of a meal. Kids love Tacos and it’s everyone’s favorite. They can’t get enough of these when they both come home for a summer break. They even like spending a lot of time behind a grill when we are having a Barbecue Party. It is an excellent family meal and a party food because they are easy to make. 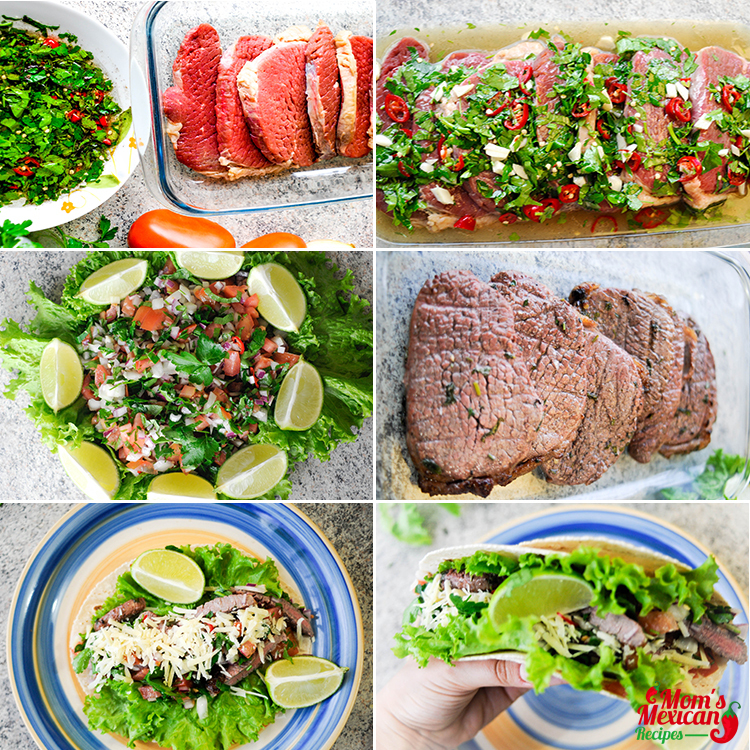 The simplicity of making Tacos without spending too much and being able to choose your own toppings gives tacos a personalized flavor. We love to add delicious meats like chicken, fish, ground beef and steak as fillings. Adding toppings such as lettuce, salsa, Guacamole and other ingredients offers endless combination. Marinate the steak with red Mojo sauce. In a bowl, mash together the garlic, chili peppers ( 2 or 4 depends on how spicy you like), cilantro, salt, and pepper to make a paste. Add limes juice, orange juice, vinegar, and oil. Shake it up really well to combine. Pour the marinade over the steak, wrap tightly in plastic wrap and refrigerate for 1 hour or up to 8 hours, the best time is around 4 hours, it allows the citrus acid to tenderizes the meat and absorbs all the flavor. Preheat an outdoor grill or a ridged grill pan over medium-high flame. Clean and oil the grilling grate, to prevent the meat from sticking. Pull the steak out of the marinade and season the steak on both sides with salt and pepper. Grill steaks immediately over high heat, until browned on both sides and cooked until desired doneness, about 5 to 7 minutes per side for medium. Remove the steak to a cutting board and let it rest for 5 minutes to allow the juices to settle. Thinly slice the steak across the grain on a diagonal. Slice steaks against the grain into ¼ inch strips. Before serving, need to make Pico De Gallo. In a bowl, mix all ingredients – tomatoes, onions, pepper, cilantro, garlic, lime juice, oil, and salt together. Toss thoroughly. Let it sit for 15 minutes to allow the flavors to mix. Warm the tortillas on a grill for about a minute on each. 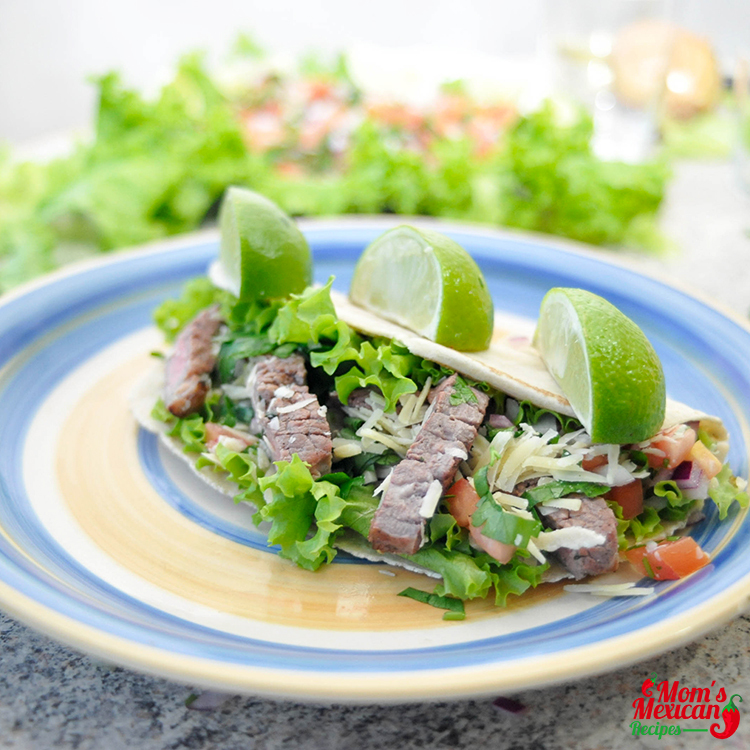 Assemble tacos by stacking 2 warm tortillas and adding the steak down the center, sprinkle with some lettuce, onion. On the top with a sprinkle of the onion relish and a large spoonful of the pureed salsa Pico De Gallo, add as much cheese as you like. Garnish with lime wedges. When cooking this dish, you can use Flank steak or Skirt steak. 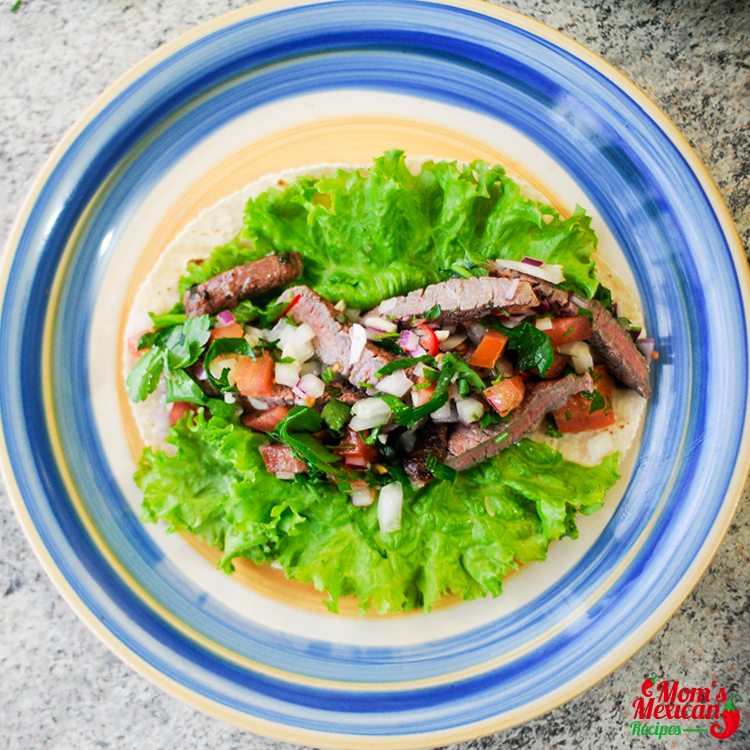 The Tacos Carne Asada Recipe is made of Flank steak marinated in Mojo paste. And adding Pico de Gallo in the mixture gives you the feeling of eating delicious authentic Mexican food. Meat should be marinated overnight before cooked on a grill over charcoal. I served it with Mexican Rice and Beans. My family and friends will love it for sure. Enjoy!